"An affecting and humorous account of one talented woman's search for organization and meaning . . . Dinnerstein's revelations amass like slowly unearthed jewels through writing, therapy and even Clutterer's Anonymous. A poignant visit with her mother, an unexpected home purchase and the trauma of 9/11 combine in a breathtaking journey that delivers kabbalistic wisdom." "A memoir filled with motivating quotes and thought-provoking paradoxes . . . The topic, ordinarily a heavy burden for many of us, is lightened by Dinnerstein's humorous insight and honesty." "One woman's quest for spirituality, simplicity, balance and meaning in life. Filled with humour and loads of wisdom, A Cluttered Life is a wonderful read, whether you're a chronic clutterer or not . . . To pronounce this book uplifting and insightful would be selling it short." "Written for anyone who has felt the pull between the chaos of everyday living and the longing for a rich spiritual life . . . This book is a journey and Dinnerstein is a faithful guide who does not close off any part of her life to her readers." "Although the book will not provide the solution to the mystery of the continually misplaced keys, it will provide an enlightening, entertaining view of one woman's difficult transition from unmanageable material world to beginning a life of spiritual fulfillment." "Not a how-to book, but an appealing and authentic spiritual memoir, full of heart, with a very likable author." "I laughed out loud, wept, and sat at my desk nodding like a bobble-head. I had found a kindred soul and through her words I gained a glimpse into my own heart." "I could relate to Dinnerstein's sincere attempts to find a better balance . . . her personality shining through each epiphany." "Wrenching and ‘can't put downable.' "
"Her honesty about her struggles and the story she tells of her efforts to be closer to God and live more spiritually aware, is sure to strike a chord with many, even if they don't face similar issues." "A funny, poignant, and revealing tale of one woman's journey into the depths of her clutter and the team of friends who helped pull her out . . . one of the best books I've read in a very long time." 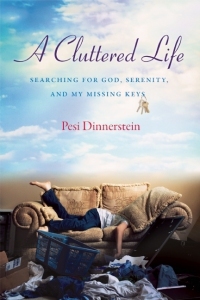 "I highly recommend Pesi Dinnerstein's A Cluttered Life. If you want to laugh, yell, and cry over a cup of coffee . . . then this is the book for you." "This author wanting a simpler orderly life found definition instead . . . Her feelings of chaos become a journey of self-discovery and spiritual awakening. Truly the artist's journey." "A memoir that enchants, engages, confounds, mesmerizes, amuses and charms the soul . . ."
"One of the more readable books I've experienced in a long time . . . A recommendation for anyone in your life, be they pack rat or church lover." "As Pesi shared her honest and amusing stories from her personal battlefront . . . there were moments when I wished I could grab a mug of coffee, run off to Brooklyn and join Pesi as she met with ‘The Holy Sisters.' "
"Mindful, inspirational and enjoyable . . . truly a memorable read, a memorable story and journey." "Since I've started reading Pesi's book, I find myself nodding, smiling, and giggling . . . If you're looking for a book to help you understand the control clutter has over you, then I can't recommend this one highly enough." "A deeply personal and introspective account of one woman's resolution to finally gain control over a lifetime of disorganized living . . . Brave indeed is the writer who can disclose to this extent." "Who can stand clutter? But Dinnerstein's is irresistible. If God is hiding in Pesi's clutter, so are friends, husbands, recipes, boyfriends, W2 forms, and the kind of laughter that makes your sides split and your soul open." "A Cluttered Life takes us on Dinnerstein's exuberant journey from physical mess to spiritual wholeness. From the first sentence on, the book is filled with wit, humor, and astute insights into the nature of clutter and its connection to spiritual growth. One of the most enjoyable and enlightening books I have read in my lifetime—and one of the funniest!" "If you liked Eat, Pray, Love, you'll love A Cluttered Life. With rip-open-the-gut honesty, Dinnerstein stares her demons in the face. But it's the roaring humor throughout that gets you to follow her lead. Where was I before this book?"